Woot’s daily t-shirts often amuse me, but until now I haven’t felt compelled to buy one. 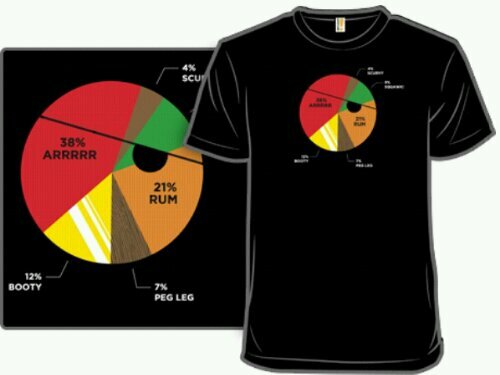 Lets count the reasons the Pie(Rate) Chart shirt is awesome, shall we? Features a pie chat detailing stereotypical pirate attributes. Pie chart does not appear to add up to 100%, which will perturb friends and strangers. Pleasure experienced in explaining the joke to the unenlightened. Last but not least, it’s a geeky pirate math joke on a t-shirt. Come on, people! If you’re still wondering what the punchline is, here you go. I love a geeky discussion thread even more than a geeky t-shirt. 2. 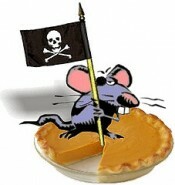 Pirates ain’t no good at mathimacation, land lubbers! As for some of the pie slices not matching up to their percentages perfectly, we felt melding the pie colors in a visually pleasing way was more important than aligning to the exact percentages. For instance, the red pie slice is supposed to vaguely look like a sideways pirate hat, as well as the peg leg placed around where the leg might be on a person, the squawk on the shoulder, and the booty…well, I won’t sink as low as our tee does on that front. Thanks again for the love/indifference!